The National Geographic Today iPad app brings a week’s worth of favorite pieces of content ranging from incredible photography and videos to articles. 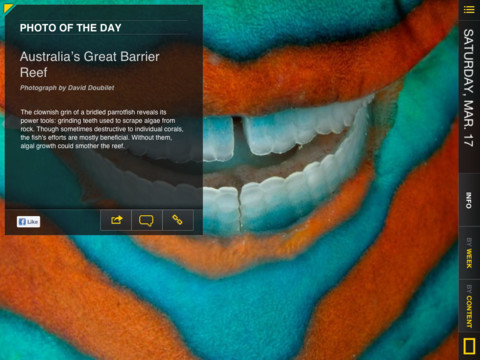 This vibrant, visually stunning iPad app is educational, informative, and encourages conversation and exploration. The National Geographic Today iPad app has three different views for navigation. It opens with pop-ups explaining gesture controls and navigation tools. The home screen contains varying sizes and shapes of bold, beautiful images that can be explored by finger swipes. If you want to check out National Geographic Today’s iPad app by week or content, you touch the appropriate icons in the lower right side of the screen. When you make a selection, the content is presented in a matrix. You explore the content by scrolling vertically with agile gesture controls. One of the neat features incorporated in the National Geographic Today iPad app is the small yellow square in the upper left hand corner of the photo. A box pops over it, and there is a brief narrative description and sharing capabilities. Not only can you learn more about the story presented in a photo, but also you can minimize the information for an uninterrupted view of the spectacular photography. I checked out photos from a feature about great hikes in the world. As I scrolled through the photos, the information gleaned from pressing the yellow icon included photo credits, location, and the best times of the year to take the hike. You can also share to Twitter, Facebook, and email with a touch. You may also comment on the content and follow the link to its original location online. 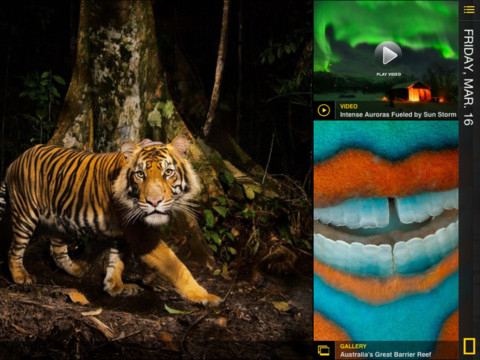 The National Geographic Today iPad app is one of several iOS apps produced by National Geographic. The National Geographic Today iPad app is free, and it is loaded with gorgeous, insightful content inviting you and yours to swipe, scroll, and tap your way around the world. AppSafari review of National Geographic Today was written by Jenni Ward on July 2nd, 2012 and categorized under App Store, Free, iPad apps, Travel. Page viewed 5060 times, 1 so far today. Need help on using these apps? Please read the Help Page.